A slender crepe gown topped with a graceful, off-the-shoulder neckline is softly gathered at the hip into a ruffle that cascades down the skirt for a fluttery finish. 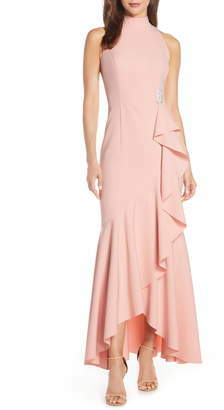 Style Name:Vince Camuto Off The Shoulder Crepe Gown. Style Number: 5499596. Available in stores.